Introduction: This paper by Alasdair Wilkie of Hibernia Networks was first published at SubOptic 2016, the cable industry’s global conference held in April 2016 in Dubai, and I am grateful to SubOptic for permission to reproduce it here. 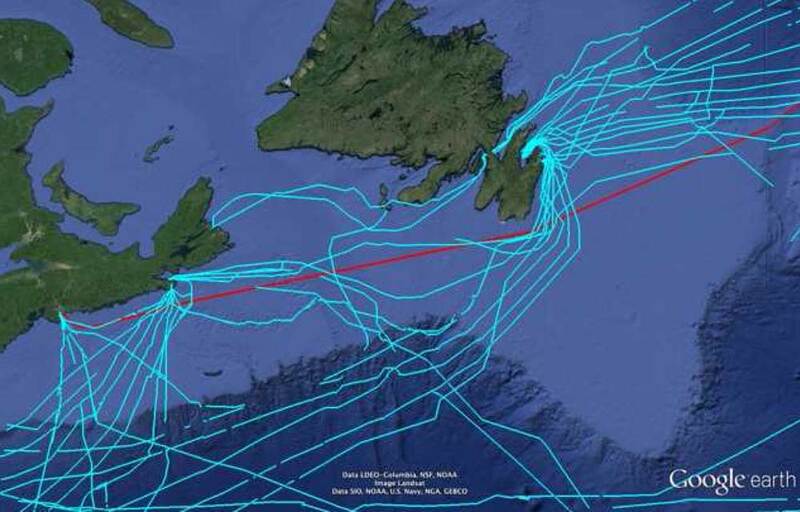 Hibernia Express, a new fibre optic Atlantic cable laid in 2015, closely follows the traditional telegraph cable routes between Nova Scotia and Britain. As Alasdair Wilkie describes in his paper, many old cables were encountered while laying Express, and a large number were recovered and identified. Alasdair joined STC (now ASN) in 1985 having left Newcastle University with a degree in Electrical and Electronic Engineering. Whilst at STC he worked on UK-Belgium 5 and subsequently numerous other submarine systems, mainly in the marine department. On leaving ASN he worked in C&W (Marine) then IT International Telecom, Flute Ltd and now he is the Director of Marine and Projects at Hibernia Networks. He has authored several papers and is a Member of both the IET and the IEEE. Alasdair represents Hibernia Networks on the ICPC, NASCA and SCUK and serves on the Executive Committee on both the ICPC and SCUK. Alasdair is also the current chairman of the Atlantic Cable Maintenance Agreement. Abstract: During the route clearance of Hibernia Express, a cable which has taken an old route across the Atlantic, but a route that hasn't been used for almost 100 years, more than fifty different cables were recovered. The oldest cable recovered was from the early 1880s and the latest from the 1970s, so there is the best part of one hundred years of cable history in one route clearance. As part of the route clearance, samples of all the recovered cables were kept, researched, and where possible, positively identified. The positively identified samples show interesting changes in cable design over the years. This paper traces the history of these recovered cables and speculates on the use of some of the unidentified cables. 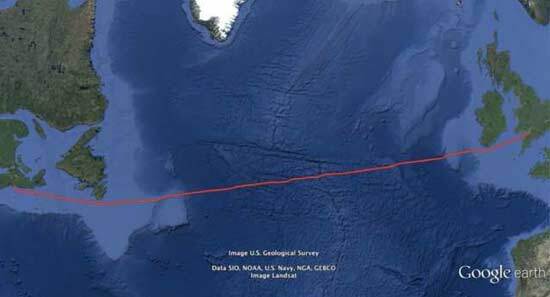 The Hibernia Express route as shown below takes a non traditional fibre optic route across the Atlantic, eschewing the usual deep water routes in order to minimise the route length between the UK and Canada. This route is not new to the cable industry, but has not been used since the telegraph cables of the early part of the 20th century. The route from Halifax, Nova Scotia, stays on the Scotian Shelf then traverses the Grand Banks before crossing the Atlantic and coming onto the European shelf. The European shelf component stays on the Porcupine Bank before coming round Fastnet Rock and then straight up the Bristol Channel to Brean. 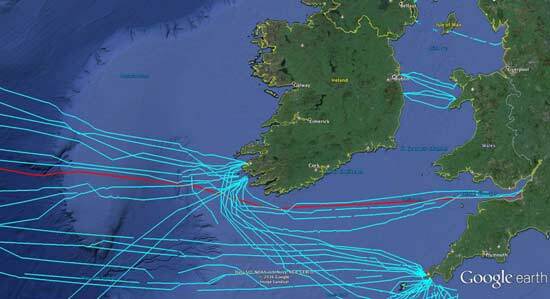 During the Desktop Study it became apparent that the route would involve very many more Out of Service (OOS) cable crossings in shallow water than a normal trans Atlantic cable route would encounter. There were a total of eighty-two OOS cable crossings, of which seventy were in water depths less than 1500m, the limit of ploughing. Of these seventy to be cleared forty-two were on the Scotian shelf and the Grand Banks, with the remaining twenty-eight on the European Shelf. This meant that there were two significant campaigns of route clearance, one Western and one Eastern, prior to the main lay beginning. The Western Campaign required forty-two OOS cable crossings to be cleared. This was only twenty-seven distinct cables, since there were multiple crossings of some cables. This was not a surprise, since the route of the above three cables is very similar to the route of Express across either the Scotian shelf or the Grand Banks. The main lay from Halifax was due to commence in late April 2015, so this put two restrictions on the Western campaign route clearance: firstly the sheer amount of cable to be cleared, forty-two cables with up to 1km of each, and also the prevailing ice conditions. Taking these two pre-conditions into account it was decided to use the CS Decisive, a TE Subcom R Class main lay vessel, as the route clearance vessel. This gave Hibernia both the cable handling and capacity and a greater working weather window, although still susceptible to icebergs and sea ice, the R Class vessels having a limited ice rating. A further complication was the Canadian Coastal Trading Act, which amongst other things restricts foreign-flagged vessels working within Canadian territorial waters. 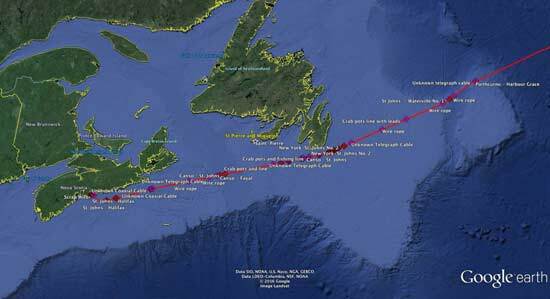 Because of this limitation it was decided that the main lay vessel, CS Resolute, would carry out the route clearance within Canadian territorial waters, leaving CS Decisive to do the route clearance from the 12 mile limit to the end of burial, some fifteen hundred kilometres. The Eastern Campaign required twenty-eight OOS cable crossings to be cleared; this was only eleven distinct cables, since there were multiple crossings of some cables. There were no ice issues with the Eastern Campaign; however the sheer quantity of cable to be recovered, in particular the OOS fibre cables, was a challenge. 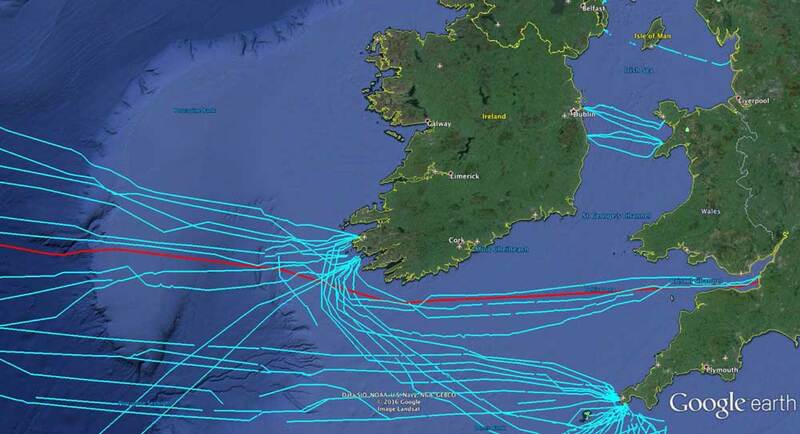 This was a result of the route through the Bristol Channel and towards Fastnet at the south west coast of Ireland. To help with this, TE Subcom made use of four vessels in total to do the route clearance and pre-lay grapnel run. The four vessels were DSV Atlantic Guardian, CS Ikaros, CS Ile d’Aix and CS Ile de Brehat. With a combination of the four vessels taking a total of 145 days to complete all the work. There was a small amount of weather downtime amongst this however the seabed conditions dictated the work rate. Similarly to the Western Campaign, the route across the Porcupine Bank to the west of Ireland had been used in the telegraph era, but this was the first cable there for over one hundred years. The other similarity is the oil and gas exploration on the Porcupine Bank and the Grand Banks, although the depressed oil price has suppressed the majority of the speculative drilling due to costs. During the route clearance quite a number of items were recovered, not just cables but also fishing nets, wires, trawl doors and other seabed paraphernalia. Since it was known that so many cables would be encountered, each vessel was requested to keep samples of any that were recovered. This has allowed some research into the cables and their history. A full list of the cables recovered is appended to the end of this paper as Table 2. In the Table it should be noted that where it is stated that a Telegraph Cable is “Known” then the data has been retrieved from either the Global Marine Systems Ltd database or TE Subcom’s own database of telegraph cables, and this has been added to by looking at the structure of some of the cables and comparing that with known examples. This has meant that some gaps have been filled in the database. Among the recovered cables there was a marked difference in the survivability of some of them, with the Halifax–St. John’s and Canso–St. John’s both being recovered with their serving intact, even though they were installed almost sixty years apart. This can be attributed to either less bottom fishing activity or a more benign seabed environment. The majority of cables recovered in the Eastern Campaign showed much less survivability and almost all of them had very little, if any, outer serving. These cables were installed in 1894 and 1952 respectively, but in construction there is almost no difference, the main difference being the size of the central conductor. The 1952 cable has a much smaller centre conductor and more insulant than the earlier cable, even though it is about 400km longer. This cable, recovered at a water depth of about 1300m, is not a traditional telegraph cable as it has no outer armouring, just serving. The cable shown below is 12mm in diameter, without the serving, and has an inner conductor diameter of 6mm. By good fortune the complete series of the four Waterville to Weston-super-Mare cables was recovered. The dates for the installation of these cables range from 1885 to 1923. Presuming that all the cables have been identified correctly, then No. 1, 3 & 4 are all of a similar standard construction with central conductor, insulant and armour wires. The difference between them is that the armour wires have changed in size and the insulant has decreased in diameter. No. 2 is of a very different construction with four separate conductors, each with its own insulant armouring and serving, wound around each other. Two cables were recovered that had dual central conductors, these being an unknown telegraph cable at KP268.655 on Seg 2, and the Sennen Cove–Valentia No. 3 cable. These dual-conductor cables were normally used close to the shore, with one of the conductors acting as the sea earth and the other as the main conductor. However, both of these cables were recovered some seventy kilometres from the shore, meaning that they were unlikely to have used the second conductor as an earth. The fact that so many of the telegraph cables were near their charted position, as well as being in remarkably good condition, is testament to the ability of the Victorians and Edwardians to manufacture a high-quality product, as well as their ability to install cables just using the sun and the stars. The unknown cables, whether telegraph or coaxial cables, throw up more questions than they answer. 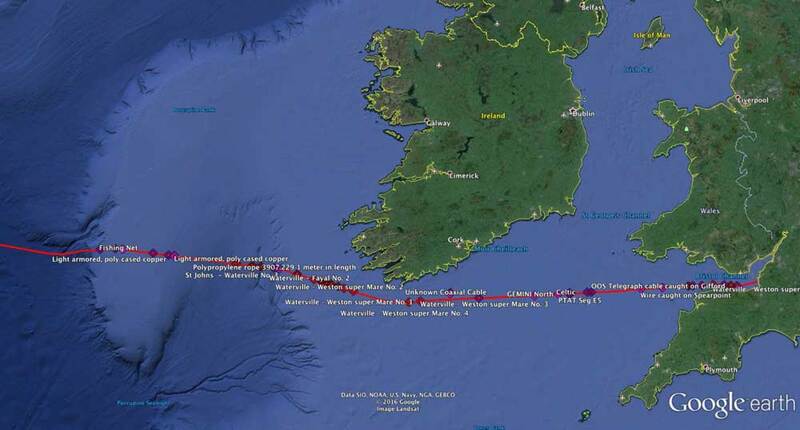 The coaxial cables may all be of military extraction, particularly the four recovered off the south west of Ireland, although this is difficult to prove. Possibly the most interesting is the single-cored cable that was recovered from deeper water off the Grand Banks. This very thin un-armoured cable is unlikely to be of a commercial nature and could be a relic from the Cold War of the 1970s.